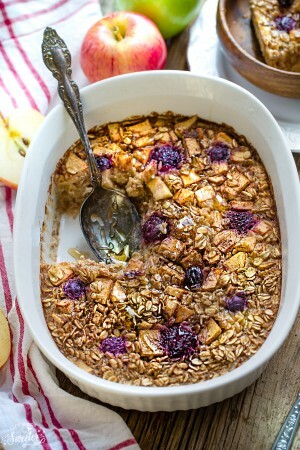 Blueberry Lemon Coconut Baked Oatmeal the perfect easy make ahead breakfast recipe. Best of all, it’s healthy, hearty, dairy free and made with NO butter or refined sugar. Loaded with frozen or fresh blueberries so you can enjoy this all year long! Do you have the same thing for breakfast every morning or do you like to switch it up? I am a big fan of anything made with oatmeal so I’ll usually make a variation of steel cut or overnight oats for breakfast. 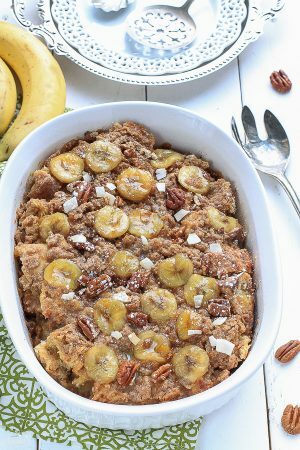 Thankfully, my kiddos love oatmeal but if they had to choose, baked oatmeal would definitely be their first choice! We love switching things up but this Blueberry Lemon Coconut Baked Oatmeal happens for breakfast a lot. Lemon anything is my favorite and I love when it’s paired with blueberry. This baked oatmeal is the perfect healthy breakfast when you feel like something a little more special than your plain Jane oatmeal but still want to keep up with those New Year’s resolutions. 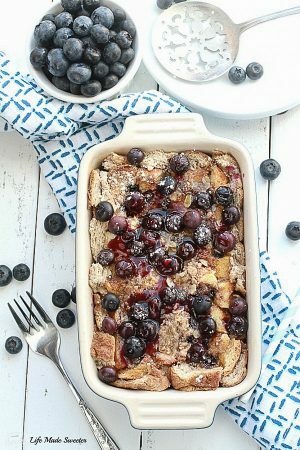 It reminds me of a more wholesome version of my Blueberry Cream Cheese French Toast Bake . There’s NO refined sugar or butter and it’s dairy free! While I used coconut milk, maple syrup and a touch of coconut oil, you can totally use almond milk and coconut sugar if you’d prefer. This comes together easily with less than 10 minutes of prep time. Plus, it’s a great make ahead breakfast that you can assemble the night before. Just mix the dry and wet ingredients separately and park them in the fridge overnight. Then in the morning, combine them together and bake it up in the oven for about 35-40 minutes. You can easily use fresh or frozen blueberries. So no matter what time of the year you are making this recipe, it can be done! I’ve made this with both and it bakes up just a little purplish if you are using frozen because of the juices, but otherwise, the taste is the same. Don’t have blueberries? No problem, just switch up the fruit with strawberries or raspberries! This baked oatmeal is bursting with fresh blueberries and lemony coconut goodness in every bite so if you’ve been struggling to get yourself out of bed in the morning, this baked oatmeal might just be that extra push you need. It’s a hearty and healthy breakfast that you can serve during the week but it’s also perfect to eat on the weekend with a big cup of tea or juice! Blueberry Lemon Coconut Baked Oatmeal is easy to assemble and makes a healthy and hearty gluten free breakfast that tastes like dessert. Made with frozen or fresh blueberries so you can enjoy this all year long! Preheat oven to 350 F and lightly grease a 2 quart (10 cup) casserole pan or baking dish. In a large bowl, whisk together the eggs, melted coconut oil, maple syrup, vanilla extract, lemon zest and lemon juice until combined. Stir in oatmeal and milk then shredded coconut until combined. Gently fold in half of blueberries to combine. Pour oatmeal mixture into prepared pan and spread evenly. Top with additional shredded coconut flakes, blueberries if desired. Bake in preheated oven for 35-40 minutes or until top is golden and the oatmeal is set. Remove from oven and allow to cool for 5 minutes before to serving. Top with coconut chips and drizzle with additional maple syrup if desired. To make ahead the night before, combine the dry ingredients in one bowl and in another bowl, whisk together the wet ingredients and place covered in the fridge overnight. In the morning, mix together dry and wet ingredients and spread into prepared pan and bake as directed.